The 2010 model year just got even more exclusive for the Dodge Viper. The Dodge brand is unveiling three new unique 2010 Viper SRT10 vehicles as part of its "Dealer Exclusive Program." Dealers who sold sufficient Viper volume to qualify were given the opportunity to create their own special editions that best meet the dreams of their most loyal customers. A total of 50 cars are being built under this program, and specific combinations were determined by each Dodge dealer who volunteered to participate. 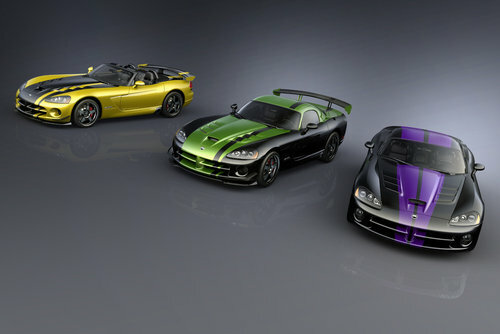 Shown here (from left to right) are the Dodge Viper SRT10 ACR Roadster, developed specifically with Woodhouse Dodge in Blair, Neb., featuring a Race Yellow Clear Coat exterior with yellow driver's stripe; the "Reverse SRT10 ACR" developed with Tomball Dodge in Tomball, Texas, featuring the reverse color combination of the Snakeskin Green Special Edition introduced earlier this model year; and the Black SRT10 Coupe with Plum Crazy dual racing stripes developed with Roanoke Dodge in Roanoke, Ill.
With this being the last model year for the current-generation Dodge Viper, 2010 continues to be the most special year of production for the 600 horsepower V-10 powered "ultimate American sports car." Approximately 500 cars will make up the 2010 model year production run, and each one is more exclusive than ever before with more than 7,000 different possible appearance combinations.